Whether you are an experienced cruiser or new to exploring the world onboard of a ship, choosing your perfect cruise trip can result in some confusion considering all the opportunities offered. As travelling by ship tends to involve a serious preparation let’s examine the key factors of how to choose a cruise holiday. If you haven’t already planned the route for the future cruise then you should take your time making the decision where to go. Nowadays, most of the lines give enormous variables for travelers. You can settle on the mainstreams like Caribbean and Alaskan cruises, or experience more exclusive places like South America, Asia and The Indian Ocean. Once you have decided on the destination, consider the details. For instance, Alaskan cruises have two routes: round-trip from Seattle or Vancouver to one of the southern Alaskan ports and one-way trips from Vancouver to Whittier or Seward, or the reverse. Choosing the date of your cruise, you should rely on your personal preferences towards the climate. Shoulder seasons, for example, are not only a good bargain but also a perfect decision for mild weather lovers. But if you are after a beautiful tan and associate “cruise” with “summer” then August somewhere in the Mediterranean would probably be the best choice. It really matters how long you are planning to be away because this criterion restricts the amount of variants at your choice. Some lines, like Carnival, offer short cruises of 3 to 7 nights. With others, like Oceania, most of the trips last 10 and more nights. 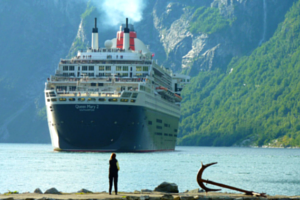 A few lines like Cunard and Holland America specialize in around-the-world cruises starting from 100 nights. The price of the cruise can often show you a whole picture about the majority of people who are going to surround you, about the “luxury” level of the ship and about the quality of food and service. So the money you are ready to spend is also a great point to be considered. Some of mass-market lines like Carnival offer voyages for $399 per person, per week; but if you prefer luxury lines, take a look at Seaborn and Regent Seven Seas with $1,000 per person, per day. After having chosen the perfect price, check whether there are any hidden expenses, especially if your choice fell with the mass-market lines. Usually all the cruise lines pay a special attention to their guests safety, however there are a lot of important rules you have to remember travelling aboard the ship. Along with memorizing safety instructions at the muster drill and scanning your passport before your trip, you should know your physical limits and exercise port precaution. Besides you should always carry cruise travel insurance which can resolve many problems like trip interruption, baggage loss, medical expenses and so on. Entertainment has always been a big part of the cruise experience, so try to choose the right trip that matches your personality and expectations. Some lines, like Disney, are the masters of the epic shows and offer huge theaters with Broadway-worthy productions. And others are more about on-board entertainment that varies from according to the ship size. The smallest ships offer no entertainment at all, except, maybe, on-board lectures and port talks. One can never plan cruise without taking into consideration the selection of restaurants and type of food they offer. So look through the information each line provides on this topic, especially if you are a vegetarian or prefer a big-chefs to manage your eateries. So make sure you did all the necessary preparations and decisions, and go search new seas and lands for memorable impressions!